This is an article by Joe Guilbeau on alternators & alternator theory for those used in our FSJ's. (Depending on your connection speed, this may take a short while to load due to the number of graphics in the page). Section 3…”The CS-130, CS-130D and CS-144…now referred to as “Generators” by Delco! By the way, what IS a good, easy, simple, semi-foolproof method for testing one’s alternator? No training required and only a valid Drivers License may be required, and perhaps an AM radio. Well, at night one may pull up to a wall with one’s headlights on High Beam, turn off everything else that is drawing power, and have the vehicle at idle. Sit there for about a minute noting the brightness of the headlights. 1…. Headlights get brighter when the engine is killed…The alternator is not putting enough charge into the battery, when the engine is killed, there is less load on the battery and therefore more battery amps are available, so the lights get a bit brighter. Alternator requires service. 2…. Headlights get dimmer when the engine is killed…the alternator is keeping up with the demand that the headlights are putting on the battery, and is charging normally. When the engine is killed, the headlight continue to draw from the battery, however the battery is no longer supplemented by the alternator, and therefore there is less voltage/current that is being delivered to the headlights, ergo the lights get dimmer. Alternator is operating normally. 3…. Headlights do not change in intensity…Congratulations, that is some battery you have…Optima perhaps? Alternatively (pun intended), a faulty diode may induce interference in the RF Frequency, or RF noise range, and this might induce an audible whine on the AM radio, very easy to check when you find that the battery is being discharged overnight. So, while doing the above headlight testing, when the engine is running at constant rpm’s, turning off/on the headlights will put a load on the alternator, and at constant engine speed if you detect an AM radio interference that comes and goes with the additional headlight load, this may indicate that the regulator circuit (diode/s) is suspect. If you vary the engine rpm’s, and the AM Radio Interference tracks the engine speed, then perhaps the bearings or the belts need servicing, or this problem might even be the spark plug wires or the noise suppressor circuit gone bad. Unplugging the alternators regulator circuit may halt the RF interference; this is a pretty good indication that the Regulator circuit (diodes) is to blame. Some manufacturers recommend disconnecting the battery first, so please be aware of the recommended procedures and follow them. Do not EVER disconnect the battery cables when the engine is running, this is no longer a viable way to test alternators and will ruin many of the versions that are in use today. In the diode rectifier circuit, the alternating current ripple voltage might be measured with AC multimeters, you should probably go out and do a quick measurement across the battery terminals to log a “normal” reading when you have a known good alternator and regulator for A/B comparisons at some later date, when you suspect that there might be a problem. Less than optimal connections may also result in high impedance, which in turn, might increase RF noise. If you understand/don’t care about the electrical characteristics of how magnetism is created in field windings and harnessed for use in alternators, please go ahead and skip this portion, and move on to “Section 2”. Otherwise, read on for a brief discussion of what is happening in the world of electricity, electronics and regulators, field magnetism, diodes and how it all comes together to keep our FSJ’s squared away. This is not very technical, and is pretty generic, to boot. By the way, even the best minds in science do not know what electricity really is, what we do know is how to harness it, but nobody really can tell you what “it” is. We can quantify, measure and harness it, but we are just not positive what holds those pesky electrons/protons together. I find this somewhat refreshing. When an electric current is passed through a conductor, a magnetic field is generated which surrounds that conductor. The reverse is also true, in which a conductor which moves across a magnetic field develops a voltage potential on its windings or wire conductor. Current will flow if a complete electrical path to ground is provided. This is a physics property that occurs in metallic structures, covalent bonding has a lot to do with the nature of the electron flow, go figure…. This electron flow is a principle of Electromagnetic Induction (EMI), and is a method of inducing a voltage in a wire that is passing thru a magnetic field. To further illustrate this physic’s principal, imagine two bar magnets placed end to end, the North Pole on the first magnet facing the South Pole on the second magnet. You now have set up a magnetic field that is present in the space between the magnets. Passing a length of wire through this space will “induce” a voltage. This is termed (oddly enough) an “induced voltage”. How much induced voltage is dependent on the length of the wire (wind that wire around a bobbin and you suddenly have a lot of wire) that is passing thru the magnetic field, and the rate of speed that the wire achieves when passed through that magnetic field. Additional wire would mean additional voltage, and therefore additional current, all other things being equal (namely the magnetic field’s intensity in this case). The wire moving through the field may take on different shapes. It might be a straight wire, or perhaps a coil or loop of wire, or even loops of wire. The longer the length, of that wire passing through the magnetic field, the greater the voltage induced on that wire. An increase in the magnetic field, will also produces an increase in the induced voltage. Also, the greater the speed at which the wire moves thru the magnetic field, the greater the voltage that will be produced (induced). It doesn’t much matter if you move the wire or move the magnetic field, both activities will generate a voltage. If the magnetic field is increased, an increased voltage will be induced, if the magnetic field is reduced, a reduced voltage will be induced. Due to the magnetic fields physical properties, these electromagnetism’s have lines of magnetic force that flow from the North Pole to the South Pole. The magnetic field that is developed and surrounds a current-carrying conductor can be visualized as spreading in a radial pattern outward from the conductor. Much like ripples of water when a stone is dropped into water, however the “ripples” of a magnetic field need to complete their path, and they always attempt to return to the magnetic structure from whence they originated. Now, just as in magnets, like charges repel each other, and unlike charges attract each other. Those magnetic lines repel each other, the stronger ones are the ones nearest the magnetic poles, since they repel other lines of magnetic force, other lines are moved further away, and so on and so forth. So, getting back to how all of this works, we find that as we manipulate the speed, the distance, or the magnetic field strength applied, the resulting induced voltage corresponds in a like fashion. Make a fist with your right hand, and do a “thumbs up”, and hold your fist in front of you, now extend your forefinger like you are pointing at something, the forefinger and the thumb will be at a 90 degree angle from each other. Now if you take your right middle finger and make a 90-degree angle with the forefinger, your middle finger will be pointing to the left across the chest area. Holding the fist in this orientation, and not moving the position of the fingers and thumb, if you point your thumb in the direction that the conductor is going to be moved thru the magnetic field, and the forefinger in the North to South direction of the magnetic flux, the middle finger will point in the direction that electron current will flow. If we increase the magnetic field, then the conductor cuts through an intensified field for a given distance traveled, thus increasing the induced voltage. A stronger magnetic field has its lines of magnetic force more tightly bound. Increasing the number of lines of magnetic force that are cut in a given distance and time, increases the induced voltage. The laws of physics (“… Aye, Captain!…”) also indicate that changing the angle of the conductor that is passed through a magnetic field will influence the induced voltage, correspondingly. A 90-degree angle has been shown to create the greatest induced voltage. By 90-degrees, we are referring to perpendicular as, for example, a knife slicing a bread loaf. 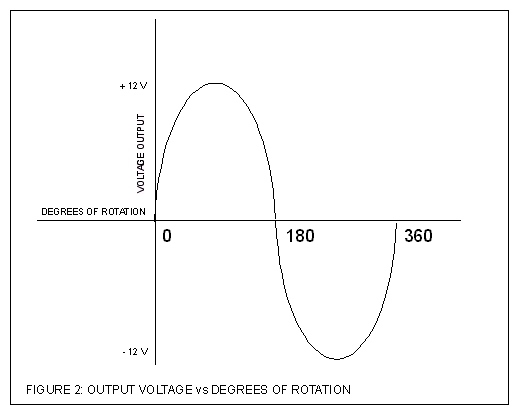 The further one deviates from this 90-degree angle, the smaller the induced voltage. This is similar to slicing that loaf of bread, if we cut it at an angle, the knife has to travel longer to cut thru the same vertical distance of the loaf, and transferring this “bad analogy” to the alternator, magnetic lines of force can be cut at 90 degrees, and thus travel a shorter distance in a given period of time. Thus they cut more magnetic lines of flux in a shorter time frame, thus generating increased voltages. Cutting that loaf of bread at a greater angle cuts the same number of magnetic lines of force, but the blade has to travel a greater distance, and takes a bit longer to complete. Another interesting physics property to note is that if we reverse the conductor back and forth thru the magnetic field, the voltages that are induced will reverse and we note that the induced voltages will be of opposite polarities from each other. One direction thru a magnetic field might induce a positive voltage, and reversing that same conductor (the opposite way) thru the magnetic field produces an induced voltage that is of the opposite polarity. Even though there is no change in the conductor, or the magnetic field, only in the direction of travel. So, moving a conductor back and forth thru a magnetic field causes voltages to be induced and the voltages will be of opposite polarities of each other. The greater the speed of a conductor that is moving thru a magnetic field then the greater the induced voltage that will be generated. The longer the conductor then the greater the induced voltage that will be generated. The denser the magnetic field then the greater the induced voltage. The closer to 90 degrees that the conductor cuts across the magnetic lines then the greater the voltage. The induced voltage is directly proportional to the rate of speed of the conductor that it is cutting through the magnetic lines of force, all other things being equal. In this sense, the rate of speed can also be tied to the number of magnetic lines of force that the conductor passes thru in a given time frame. Increasing the speed or length of the conductor or magnetic field strength will all result in increasing the induced voltage. The same can be said of the opposite, reduce any of the properties mentioned, and the induced voltage will be reduced in direct proportion. If the conductor that the magnetic field is passing through is part of an electronic circuit, then current will flow in proportion to the induced voltage. The induced voltage creates the current flow, and if you can find a way to prevent the voltage from rising, then the current has to increase, limit the current and the voltage needs to rise. An alternator has a coil of wire wound around a Ferro-resonate material. In this manner, an electro magnet is created, because DC current/voltage is applied to this coil, current flows thru it, and they create a magnetic field. This magnetic field is polarized, which simply means that it has a North Pole and a South Pole. This is essentially the rotor, and as it rotates, its magnetic field cut the Stators coil windings, by creating a whirling magnetic field. When a current-carrying wire is wound into a number of loops to form a coil, the resulting magnetic field is the sum of all of the single loop magnetic fields added together. Increase the loops making up the coil, and you increase the magnetic field. 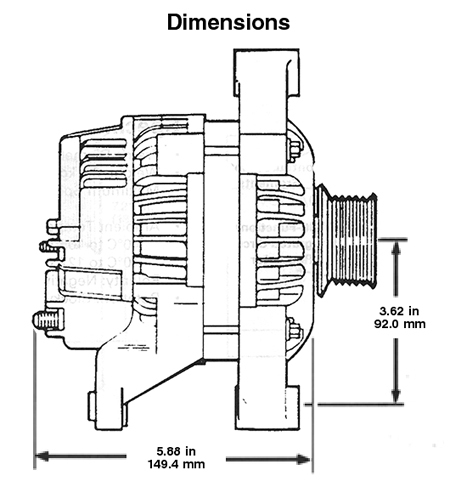 In review, the rotating core of an alternator has an iron core, which is called an armature. This rotor or armature has copper wire wrapped around it. Passing 12Vdc to this coil of wire, results in direct current flow, which in turn produces a magnetic field and magnetizes the iron core, thus making the magnetic field denser. 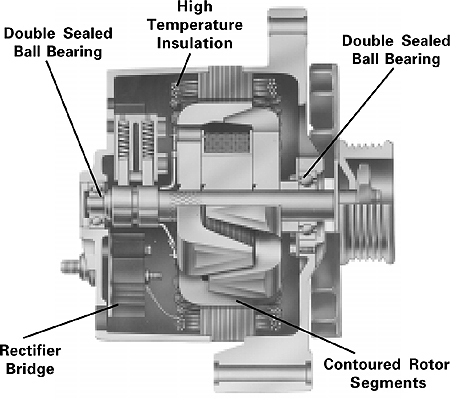 The rotor is heavy and is supported in the alternator housing via front and rear bearings that support a shaft, outside the alternator, a pulley is mounted on this shaft, to engage the alternator belt, which is driven by the pulley on the crankshaft. The stator of the alternator is made up of three loops or coils of wire that are mounted to the housing of the alternator, which are stationary. The rotating magnetic field whirls through these coils of wires inducing three voltage waveforms. Now, since this rotating mass is changing the angles of the field strength (magnetic field) as it rotates, the induced voltage and the current that these stator loops carry vary accordingly. So, now we have a dense magnetic field and as the engine speed of the vehicle increases, we can see how the density of that magnetic field increases. As this magnetic field is rotated, an induced Electro Motive Force is created in the three phase stator windings that are 120 degrees apart. Here is a hint…want to know if the brushes on the alternator need replacing, put a screwdriver against the alternator, being careful not to get it hung up on anything, and check out the magnetism that the alternator puts out. With time, you can “feel” the difference in magnetism intensity, and judge “good” brushes and “bad” brushes. Each stator loop coil creates a 360-degree voltage that is known as a sine wave. 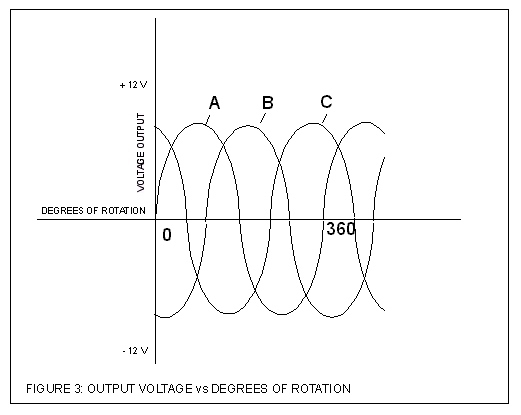 The induced voltage gradually increase until the angle is at 90 degrees (peak induced voltage and low current flow), and as the angles decrease again, the voltage decrease correspondingly (as the current increases); until the magnetic field begins to approach another set of stator loops or coils of wire, and the process starts all over for that particular loop coil, see the below picture to visualize this process. In our alternator example, we have three loops of wire, and these three loops are placed such that a sine wave in each loop is generated. A complete revolution of the rotor assembly, which is 360 degrees of revolution, gives us three overlapping voltages that are 120 degrees apart (360 divided by 3 equals 120). The configuration of the windings (and associated diode rectification configuration) causes these Alternating Current (AC) sine waves to overlap each other, as depicted below. Once the AC voltages are created, we need to modify them because our Jeeps run on 12Vdc. The battery is responsible for supplying power to the electrical loads, and the alternator is responsible for keeping the charge rate of the battery within design limits. These overlapping sine waves have their negative going voltages blocked off by diodes, and thus we end up with a series positive humps of DC voltage. 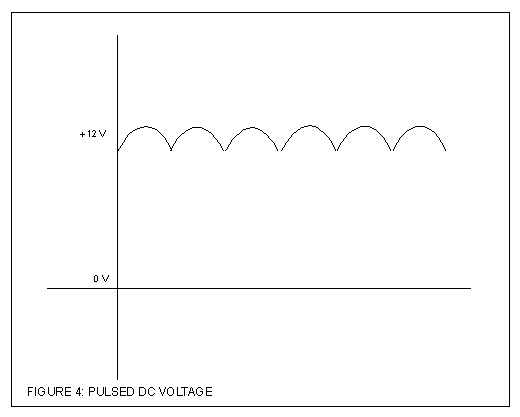 This is referred to as a full wave bridge rectifier, as you can see in the below image. Electronic components in the regulator circuit smooth out this voltage, in order to generate the 13.5Vdc to 14.8Vdc required by the battery for topping off its charge. The various regulators associated with alternators are responsible for this engineering feat. We are generating the AC voltage needed, in order to rectify or alter it, to produce a voltage and a current that is sufficient to charge the vehicles battery. The alternator is a three-phase generator with a built-in rectifier circuit consisting of six diodes in a full-wave bridge rectifier circuit. The DC voltage and current from the battery is supplied to the Rotor through the use of slip rings mounted on the pulley shaft. In essence the diodes are solid-state switches with no moving parts, making them maintenance-free, until a failure mode is encountered. When they fail, they usually short, either totally or partially. Partial shorts in diodes are referred to as “leaks”. Leaking diodes will allow charging of the battery, and when the vehicle is left sitting for a period of time, like overnight, the battery may discharge through the leaky diodes and not start in the morning. When the rectified DC from each of the three-phase windings is added together or superimposed upon each other, the positive peaks overlap to produce a much cleaner DC with much less ripple. Trust me when I tell you that the copper wire used in the rotor and the stator are specifically selected for their intended duties. Speaking of Rotors and Stators, here is a simple trick that helped me distinguish them from each other. Lead-acid auto batteries last longer when charged with pure DC voltage with low ripple. Three-phase windings were designed into alternators to produce DC of great purity, at least within the monetary guidelines of getting a decent return on investment. 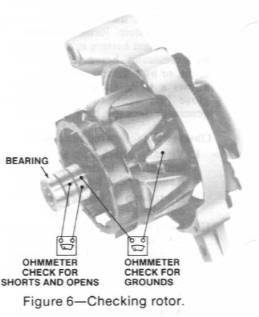 As the alternator’s pulley is rotated by the alternator belt, (connected to the automobile engine's crankshaft), the rotor is spun past a stationary set of three-phase windings that make up the stator. Recall that changing the magnetic field will change the induced voltage. 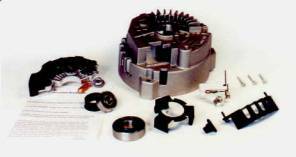 Automotive engineers take advantage of this fact by altering the field strength of the alternator (rotor assembly) in order to correspondingly change the output of the Stators’ rectified AC voltage. Speaking of the rotor, you may be wondering how in the heck do we get reliable electrical connection to a rotating assembly? The engineering folks used a clever set of copper "rings" incorporated into the shaft of the rotor assembly. Stationary “carbon brushes" are held in firm contact with these “slip rings” by spring pressure. This supplies the voltage (derived from a fully charged automotive battery) required by the rotor assembly to create the magnetic field. The rotor receives DC voltage and current, and the stator windings utilize the resultant induced EMF to generate AC voltage and waveforms. The rectifier (full wave bridge) converts the AC waveforms (all 3-phase’s) to a DC voltage and current with a ripple voltage capping it. The regulator circuit helps smooth out this DC charging voltage and current, which becomes the alternator’s output. Many modern alternators are equipped with built-in "regulator" circuits that automatically switch battery power on and off to the rotor coil in order to regulate output voltage. It is the regulator’s job to control all of this diode rectifying and modulation of the field strength, in modern day alternators. Some regulators are designed so that the field strength is such that it will not produce an output in the stator windings until a minimal threshold level is overcome. One of the other rather “odd” situations out there revolves around some “OEM Regulators”; early on it seems that the automotive battery could discharge thru the regulator/ignition switch when the ignition switch was turned off and the points happened to be closed. This provided a leakage path to drain the battery, in an automotive application; this could take a month or so. The tractor guys brought this “feature” to light, after all, a battery in an auto is likely to be started at least once a month, and as such this parasitic draw was not very noticeable. I will leave it to others to explain valence electrons and positive ion flows, I will just say that opposites attract, and pass over the details at this time. 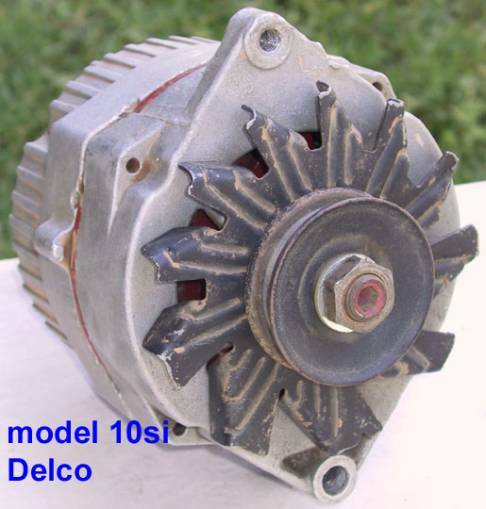 These were the 1st generation of Delco/Remy System Integral (“SI”) alternators, meaning that the regulator was mounted inside the alternator, instead of being a separate unit on the firewall, and began showing up in the very early 70’s in GM products it weighed in at about 10.5 lbs. This becomes quite a handful when replacing in some vehicle applications. 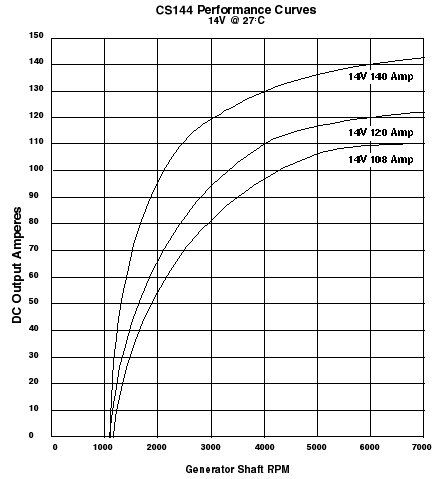 With all OEM components installed they had outputs of 37-amp, 42-amp, 55-amp, 63-amp, 70-amp, and 85-amp (according to my ’83 TSM) ratings, outputs higher than 100 amps can be purchased but the heat dissipation and cooling requirements needed are just not incorporated into these units, therefore most if these higher output conversions are simply not recommended. Cooling is accomplished via three vertical slots on the rear housing and a pulley mounted cooling fan. The heated air from the passenger side exhaust manifold is drawn into the housing. 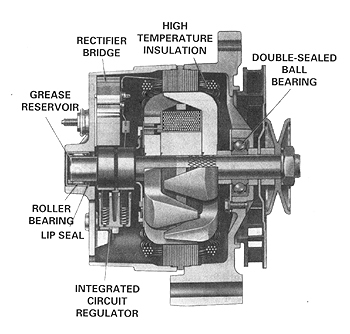 The threaded mounting hole and orientation of the regulator connections determined the “clocking” of an alternator (see Image 003). 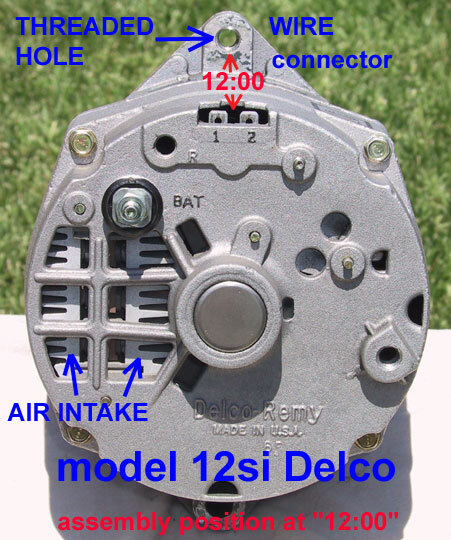 Delco SI-series internally regulated alternator have the following connections. One large connection that is the Alternator output, known as the Bat, this connection has "Bat" cast into the housing (aftermarket housings may not incorporate these markings). Two additional tabs (inputs to the internal regulator) are used to interface the vehicles wiring harness, these have "1" and "2" cast into the housing next to them. A two terminal Molex connector is generally used to connect the wiring harness to the regulator circuit. "Bat"- this terminal is for the alternator output to the battery. On some jeeps this output goes directly to the ammeter inside the cab, and returns and has a fusible link in series somewhere along the line. Later versions used a voltmeter, and this terminal went to the solenoid and on to the Pos-Terminal of the battery. "1"- this terminal (usually closest to the "Bat-terminal") is fed from the Ignition thru a lamp ("idiot light"), and is used to supply the magnetic field inside the alternator with the voltage needed to operate. When the engine is running, if the idiot light is on, the output voltage of the alternator is out of specification. Some vehicles utilized a resistor wire of 15.6 Ohms in lieu of the lamp to drop the voltage at this terminal to specified levels (this may be regulator specific). Nichrome wire is difficult to solder to, and it is getting hard to find insulated versions of it, notably due to the fact that traditional usage is for a heating element for cutting foam products and these applications do not need the insulating wire jackets. The lamp limits the voltage to the "Field" terminal, and this current limited voltage is what tells the regulator to start/continue/stop charging. When the alternator begins to charge, the voltage increases at the battery. This increase in voltage eventually reaches a point (as the alternator charges the battery) to where it is equal to the voltage divider circuit designed into the alternators regulator. Thus they equalize out and the voltage being fed to the "1"-Terminal during normal vehicle operations the lamp only lights when there is an over-voltage or under-voltage condition. The “idiot” light is there to act as a “visual enunciators” under voltage and over voltage conditions at the battery. Either of these conditions will energize the "idiot" light. "2"- this terminal can be fed from the positive battery post or the starter solenoid where the positive battery post connects to the solenoid switch. This is an input to the alternator that is used to sense the battery voltage; some applications use a modified regulator circuit and may only use one or even perhaps neither of these two regulator terminals. One-wire alternators come to mind here. That is about all there is to it, in the most simplistic terms. 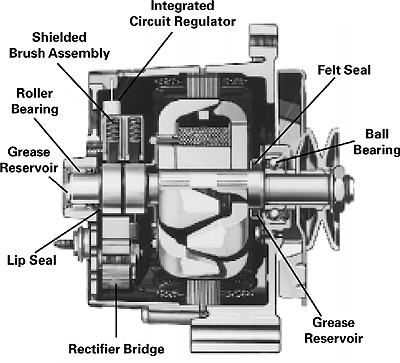 For a bit more on the regulator circuit itself, read on...this will get technical in nature, so go ahead and skip on down (to Section Three), if your eyes begin to glaze over. The Number two terminal above is connected to (most likely) the solenoid terminal hooked to the positive post of the battery, or is set up a for remote sense (the preferred voltage monitoring location), and connects to the braised or soldered fan-out connection, and senses the charge condition of the battery, and routes this voltage to a voltage divider network (R2/R3) with a capacitor (C1) to filter it inside the regulator circuit. This voltage divider network limits the current discharge to negligible amounts. The voltage divider (R2/R3) supplies a reference voltage to Zener diode (D2), which is now “Off”, and thus blocks any voltage so that there is no forward bias on the base to emitter junction of the NPN Transistor TR2, therefore it cannot conduct. This results in the emitter of TR2 being pulled “High”. So now base drive can be applied to TR1. The regulator circuit is now being fed from Terminal 1, which provides base drive to TR1, thru R1 and D1. D3 is reversed biased and is blocking current flow. With base drive, TR1 is forward biased, and it acts like an “On/Off” switch. When it is on, it provides a path for current to flow from the rotor’s field windings (supplied by Terminal 1) to ground thru its emitter/collector junction. Therefore the alternator is charging at this point, because current is flowing from the ignition switch thru the No. 1 Terminal on the alternator, thru the field windings coil and continues on thru the emitter/collector junction of TR1, and to ground. The lamp circuit cannot supply enough current to the field windings to sustain or generate the magnetic field in order to induce a voltage output on the Stator windings. 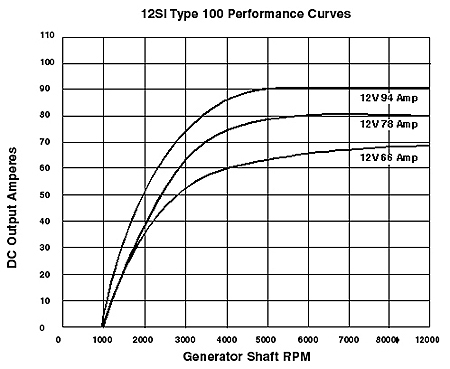 So, in many applications the vehicles engine must be revved to a higher RPM in order to generate enough initial field strength so that the induced EMF is sufficient to self maintain it. The battery is now being charged by the alternator, and therefore its voltage begins to rise. The voltage divider network (R2/R3 which is factory adjusted) begins to see the voltage across R3 rising, in time the alternator charges the battery sufficiently so that the voltage rise across R3 reaches a threshold. This threshold voltage forces Zener diode (D2) to be biased into conduction, which in turn provides TR2 transistor with base drive. TR2 transistor’s base to emitter is now forward biased and therefore its collector voltage is essentially “switched” to a diode drop potential above ground. This turns off base drive to TR1, which “switches off” and no longer provides a path for the rotor field current circuit, and the rotor field collapses, because there is no longer any current flowing thru its coil. Bringing the junction of R1 and the Cathode of D1 to ground potential results in reverse biasing the cathode/anode junction and therefore the Base to Emitter junction of TR1 is now reversed biased and it no longer conducts and switches off. The following diagram illustrates the point, as the base drive controls the “On/Off switching” of TR1… when the switch is on, the rotor coil current flows, when the switch if off, no current flows in the rotor and the field collapses. Thus the alternator generates Alternating voltage and current. A diode trio rectifies the current that flows through a transistor, which feeds the field windings of the rotor, self excitation if you will…don’t even go there, I’ve heard it all before. This happens over and over...energizing and collapsing the magnetic field thereby controlling the alternator output, it is a wonder that these alternators last as long as they do. Each regulator circuit has its own designs and circuitry, which may very well differ from the specific description above. The above example was given to illustrate the basic operating principals of the regulator circuit, and happens to be the circuit that is generally on the 10=SI and 12-SI units. Delcotron 12-SI with 6 cooling air intakes…these were available in 56-amps, 66-amps, 78-amps, and 94-amps. 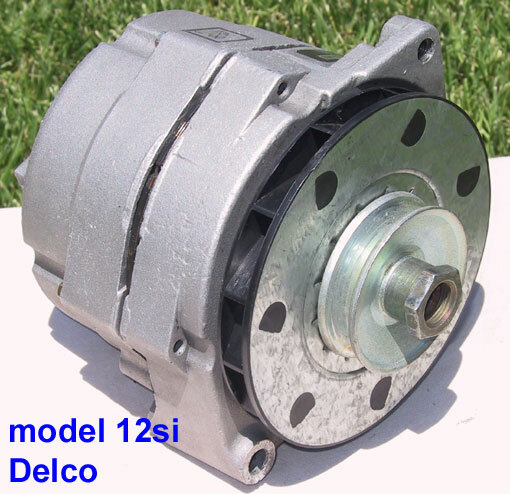 The cooling fan on a Delco 12-SI alternator is easy to spot, as it backs up the alternator pulley and is a black thermoplastic with a metal plate attached between the fan and the pulley for added strength. I am referring to the OEM alternators here. These models began appearing around 1983. With under hood real estate becoming a premium and greater electrical loads making demands on the alternators, the 12-SI with it’s increased cooling and higher output became a popular component. Larger air intake ports on the rear of the alternator also contributed to cooling. These units can be purchased from aftermarket vendors up to 140 amps. The interior and cooling components incorporated in these units make this feasible. Improvements in the regulator circuit designs have occurred but the operation is basically the same as in the 10-SI Series. These units are pretty tough and usually give years of service. The illustrations above depict a typical CS-130 and CS-121 view. The rest of this post refers to the Delco CS units (CS-121, CS-130 and CS-144) CS stands for Charging System and the 121, 130 or 144 number behind a CS-*** refer to the outside diameter of the stator in millimeters. 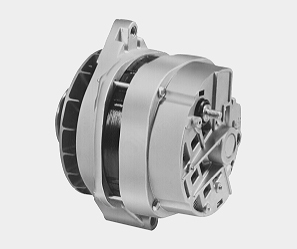 The Delco CS-series alternators are supplied in 61-amps, 70-amps, 72-amps, 74-amps, 80-amps, 85-amps, 96-amps, 99-amps, 100-amps, 102-amps, 105-amps, 108-amps, 124-amps, and 140-amps and 145-amp configurations. The below active link is a reference page that I pulled the above information from…as I mention, there are many configurations. Just be aware that there are many CS-Series regulators out there in re-manufactured units. For those of you with an interest, the Patent for the CS 130 Bridge Rectifier is presented below. These regulators are essentially computer chips now, and feature surface mount technology and a host of other features. I mention this so that the reader might come to the conclusion that one may not treat these “regulators” in the same fashion as the earlier more rugged designed regulators. Page one of PATENTS 4,606,000 August 12, 1986, BRIDGE RECTIFIER (Bridge Rectifier for CS130 generator). The above link will allow you to input the Patent number (4,606,000) as a “search string”, in order to view the patent information submitted to the US Patent Office. You may view pages 1-15 of the original patent for the CS-130 Alternator and the Bridge Rectifier as granted on August 12th, 1986. I like patent info, some of the BS out there is really incredible, and a little research at the US Patents Office can shed some light on what is real and what is hype. Aftermarket ignition systems come to mind here, I like MSD! You must have a reader in order to access the patent information, the reader is free, go to the URL below to get the free reader, after you choose the correct version for your OS, you can load the free reader and take a look at the images that were filed as part of the Patent process (Engineering Design Drawings, Mechanical CAD/CAM). : 10. “…PTO's full-page images, nearly four terabytes overall, are stored and delivered at full 300 dots per inch (DPI) resolution in an image file format called "TIFF," using CCITT Group 4 compression. This is the format, which is required by the international standards to which all patent offices must conform. TIFF is also the most used image format in the world. Unfortunately, due to the volume of the image data, available funding, and other technical considerations, PTO cannot convert these images to a format more popular on the Web either permanently or by converting on the fly as they are delivered. As a result, you must install and use a browser plug-in -- similar to those required to access Adobe® PDF files, RealPlayer®, or Macromedia Flash® files -- on your workstation in order to view these files directly. An alternative method is to use third-party software or services to view these images either directly or after conversion to another format, such as Adobe® PDF. The plug-in you use cannot be just any TIFF image plug-in. It must be able to specifically display TIFF files using ITU T.6 or CCITT Group 4 (G4) compression. The only free, unlimited time TIFF plug-ins offering full-size, unimpeded patent viewing and printing unimpeded by any advertising on Windows® x86 PCs of which we are aware are. After the introduction of the CS-130, Delco modified the alternator and came up with the CS-130D. This translates to a Charging System with a 130 mm diameter stator with a dual internal fan set up (D-designator). The CS-130 also had dual fans, one external mounted next to the pulley, and one internal fan mounted on the rotor designed to cool the rectifier, regulator and bearing, while the CS-130D has BOTH fans mounted internally. Early CS-130’s were issued with 8mm bearings and were later upgraded to more durable 10mm bearings for improved service life. There is an “Iceberg Kit” for these alternators that includes a replacement housing, larger bearings, and pumps up the alternator output to up to 140 amps or so, for around $90 dollars. A bit more on this later. The CS-130D has one additional safety feature, if the internal temperature of the alternator rises above 280 Degrees F, the unit shuts down, and you must wait until it cools down, before the unit will operate in a normal fashion. What with waiting in line, and getting the vehicle set up, it is something like 30 minutes later or the next day that the tech tests the vehicle. Volia!…nothing is wrong. Your temper is at max…film at eleven! No one was wrong, everyone was right in this situation…go figure, the more you know…. I happen to like the CS D-series of Delco alternators. A quick note is warranted here, the Delco CS-130 regulators are “smarter” than the previous designs, and incorporate an under-voltage detection scheme built into the regulators. This means that the alternators may not “turn on” if the “sense” circuit detects a battery voltage substantially less than 12Vdc, unlike the earlier 10-SI and 12-SI regulators. This is not an iron clad rule as there are various setups regarding wiring the CS-130 alternators into a vehicle, just make sure that the battery you install is fully charged. So, get those batteries fully charged. Some might think that alternators are designed to charge batteries, but this is really not the case, they are designed to maintain a fully charged battery, there is a distinction and the reader would do well to become aware that this distinction exists. These alternators incorporate higher efficiencies with improved cooling. They utilized a pulse train control to manipulate the magnetic field strength via pulse width modulation of a 400 Hz pulse train. This generally means that inputs to the magnetic field are more gradual, and therefore the alternators output will respond in the same gradual manner. The duty cycle (how long the pulse stays on and off) can be controlled in order to create a “soft start” capability that is easy on things like electronics and computers and such. There are 2 cooling fans used in the CS-130’s, and internal unit and an external unit, the alternators are smaller and more efficient that their predecessors. Recall that the CS-130D’s utilize dual internal fans. For further cooling, try out the “Iceberg Housings”, which add cooling fins over the regulator area for additional heat sinking properties, as shown below. National Quick Start has a kit to upgrade the CS-130’s to 140 amps, reusing the front half of the housing, your existing rotor, the voltage regulator, plastic fan dust shield, fan, pulley and the hardware. You get a new rear housing similar to the one below and new upgraded stator, rectifier and heat sink, new larger bearings; all for about $100 dollars. So, go find that used CS-130 (look for brand new shiny ones, as they are generally supplied by the OEM Delco manufacturer and may be found on late 80’s GM vehicles for about $20 dollars) and buy the “Iceberg Upgrade Kit” kit, then you will be set. Here is an “Iceberg Kit” from Quick Start (see below image), and it is a re-builders kit for the CS-130 and also a kit that will increase the output amps to 140-amps, the below image is for the standard upgrade kit only. In the Image below, you can see the kit for the 140-amp upgrade as it includes the additional re-wound stator. Getting back to the CS-series alternators, the diode trio’s that were used in the “SI-series” alternators have now been dropped, and the CS-series use avalanche diodes instead, that are capable of handling 55 or so amps in the better regulator/rectifier circuits, such as OEM supplied components. There are at least 14 Application Specific Voltage Regulator (ASVR) aftermarket regulators for the CS-series alternators that I personally know of, and I certainly do not know them all. Delco calls their rectifiers All Silicon Voltage Regulators (ASVR), alluding to the fact that these upgraded regulator designs are indeed computer chip designs. They also refer the alternators as “Generators” now. 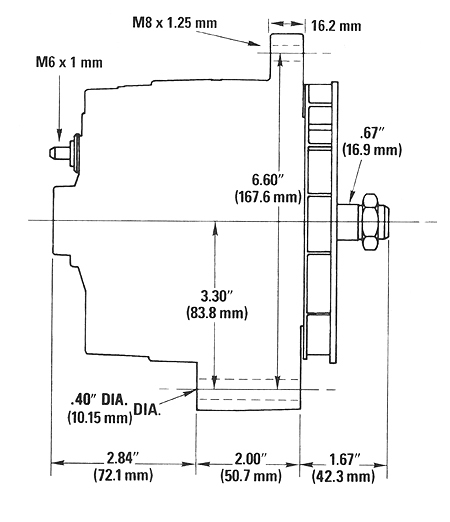 These regulators are what are referred to in the electronics industry as Application Specific Integrated Circuits (ASIC’s), and as such, the original designs by Delco/Remy have been reversed engineered by aftermarket vendors in order to make a higher profit margin by providing their own versions of these regulators in remanufactured/rebuilt alternators. Some aftermarket units are better than others; none are likely to be as reliable as OEM…or as expensive! 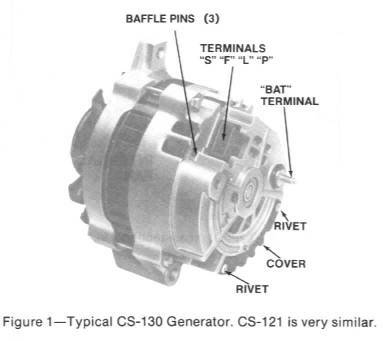 The terminals on the CS130 series alternator also have a different design, as depicted in the schematic diagram below. Earlier we discussed the 10-SI and 12-SI regulator circuits, where transistors were used to provide a solid-state switch for the return path of the field voltage. These have been in use for many years. Note that while the overall concept is the same for the CS-series generators, the “base drive” to switch the field magnetic strength on and off is now controlled by pulse width modulated train of varying duty cycle pulses that controls the density of the induced EMF on the field windings and gives greater and finer control over the Stator winding output. Thus the term ‘Generator” is now being used by Delco. In the above schematic, you can see how a voltage divider circuit can be utilized in order to give the end user further control of the regulator as one might wish to send the “S-Terminal” (Regulators sense voltage) a lower voltage, thus causing the regulator to slightly increase the alternators output. This might be used to mitigate some additional loads on the alternator, especially if switched in on a vehicle whose RPM range will not get much above idle and excessive amperage loads are used such as rock crawling in the night. As a side note, please be aware that the above configuration may not work on all CS-series regulators. Some regulators will respond fine just using the S-Terminal as depicted above and no Lamp connection. Some CS-series regulators may only require the I-Terminal to be connected to an Ignition Source, and therefore will work fine without any other wiring connections. The CS-series of alternators use a 4 terminal regulator, with terminals designated as PLIS or PLFS, commonly referred to as PLI/FS. It is next to impossible to know if a PL(I)S or a PL(F)S regulator is in the unit, you have to take the case apart and check the part numbers on the regulator. There are apparently methods to bench test and determine the regulator type, but this is best left to folks who have access to the various cross reference documentations and is beyond the scope of this particular article. The documentation may be purchased at outlets that support the alternator servicing community. If you know the make and manufacture of vehicle that the alternator is designed for, then you can track it down. Some of the regulator circuits stamp either the “I-designator” or the “F-designator” on the plastic housing; others however do not do this. Just be aware of the ions. Some regulators have PLI/FS terminal markings, so it can get confusing at times. Although testing via resistance and voltmeters can detect most variations, the test set up is best left to a test bench. Again with all of the different regulator circuits out there, some in-depth knowledge is required so that damage to the regulator circuits do not occur, and there are a plethora of designs out there, both OEM and especially after market. 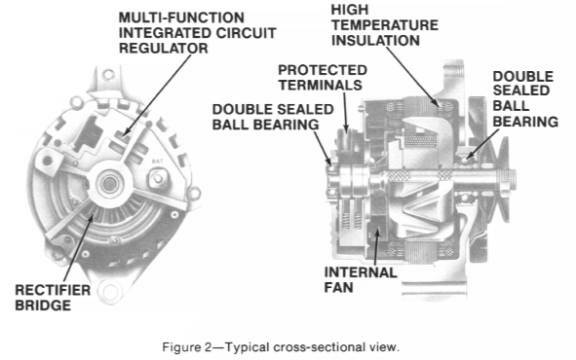 Another caution is in order here; the ASVR and earlier regulators in the CS-Series alternators can easily be damaged by improper servicing techniques. Please observe the following precautions when removing or installing these alternators. Always disconnect the Negative Battery Cable before doing anything! P-Terminal: The Pulse/Phase terminal can provide a 12V square wave to determine alternator speed, used by some Electronic Control Modules or vehicle computers. Connects to the stator. Some ICU’s monitor this signal and adjust engine parameters accordingly. L-Terminal: This terminal is connected to the “Low” side of the warning lamp, with the lamp’s “High” side being fed by the ignition circuit. Some regulators require a 35-ohm resistance inline with this circuit if no lamp is used otherwise alternator damage may ensue. Some applications have a resistor connected in parallel to the lamp in case the lamp bulb opens up and burns out. The resistor will be there to provide a path for current and voltage. Some vehicles supply a 5Vdc reference to this terminal from their ECU or Computer; other vehicles don’t, so be aware of the various models of regulators. Other regulators may be tested by application of a 50-Ohm pull-up resistor to connect the L-Terminal to the 12Vdc source, I believe that any resistance between 35 Ohms (5-Watt resistor) and 500 Ohms (1/2 Watt resistor) can be used safely. F/I-terminal: has several duties depending on the specific regulator, some regulators have a resistor that is internally connected between the Field and Lamp terminal. Other regulators use the F/I terminal to provide field duty cycle information to the vehicles Electronic Control Module or computer. These regulators are not interchangeable, but for our Jeeps, it hardly matters. For ECM related vehicles it can be of paramount importance. If the alternator that is selected comes from a vehicle that only uses the I-Terminal then the wiring may simply require a wire from an ignition source in order for the alternator to operate correctly. 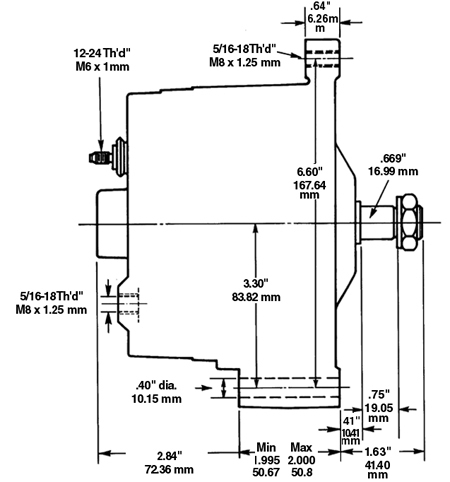 S-terminal: This is a heavier gauge terminal spade lug that is connected to the battery. This terminal is the “Sense” circuit and monitors battery charge. The S-terminal on the CS-130 regulator is larger than the other three terminals. The CS-130D Alternators have the following connections…NOTE: All of the Terminals on the CS-130D regulators are the same size. P-Terminal: Provides a 12Vdc square wave as in the CS-130 application. F/I-Terminal: It gets a bit tricky here, as some applications do not incorporate a lamp circuit. In vehicle applications of the “no lamp” kind, this terminal is connected to the Ignition Switch, and an internal resistor is used to limit current and voltage. Other regulators use this terminal as an output and refer to this pin as a Field Terminal, as such, it provides an output that is proportional to the field duty cycle of the alternator to an a vehicles ECM. The ECM now has an input to sense alternator loading and engine loading, and can increase/decrease engine speed accordingly. Here is an important consideration, since the regulators on CS-130D type alternators have these two different types of regulators (F-Type or I-Type) they cannot be interchanged. I-Type regulators use the F/I-Terminal as an input and this can simply be an ignition source 12Vdc voltage that the alternator uses; F-Type regulators use the F/I-Terminal as an output (this ion is a signal that is provided to the vehicle computer and the computer uses it to monitor the field intensity of the alternator as an input. If you supply a 12Vdc signal to this input, you may very well ruin the alternators regulator. L-Terminal: This is the lamp terminal and operates in the same manner as the CS-130 lamp circuit above. It is of interest to note that some applications use the ECM to send the L-Terminal a signal (5Vdc reference), and the F-Terminal responds with a signal sent to the ECM, in this application the ECM and the Regulator form a “closed loop” to control engine loading and alternator output. S-Terminal: This is the “Sense” terminal and is connected to the battery. It senses the voltage level of the battery and feeds the regulator circuit this reference so that the regulator can adjust the Pulse Width Modulation to control the alternators output. The S-terminal on the CS-130D regulator is the same size as the other three terminals, unlike that of the CS-130. Since these CS-series regulators are now essentially an electronic computer chip, so always disconnect the battery before servicing, and do not EVER remove the battery cable when the engine is running. If you simply must do this, you may have just destroyed the regulator’s computer chip. You must really begin to think of these alternators as computers, and treat them with the respect that you might a laptop computer. 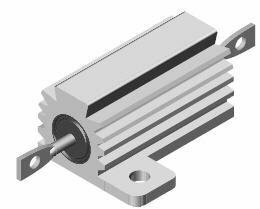 CS-Series alternators use diodes within the rectifier plate known as avalanche diodes. Original equipment designs use avalanche diodes in both positive and negative plates with a forward voltage of 0.9V @ 100 Amps and an avalanche voltage of less than 40 volts, in the better-designed regulator/rectifier units. There is an up and a down side to using these devices. On the up side, they prevent damage and surges, current spikes, and such from reaching sensitive electronic equipment inside the cab and under the hood. On the down side, due to the nature of their operation, their lifespan is not as long as the earlier diode trio’s used in 10/12-SI alternators. Still, many years of service can be expected, just not decades as in earlier alternators, I believe that the service life of the CS-series alternators is somewhere around 80,000 to 100,000 miles depending upon specific model number (CS-121, CS-130, CS-130D and CS-144. We don’t need to go into Epitaxial Planar Diode structure, just suffice it to say that the OEM regulators and diodes are tested and function the best. Try to stick with alternators that were rebuilt with OEM parts, you will generally get a better quality rebuild. 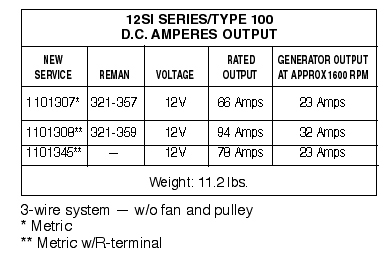 As an aside on the subject of diodes used in the CS-130D series of alternators, consider the following. 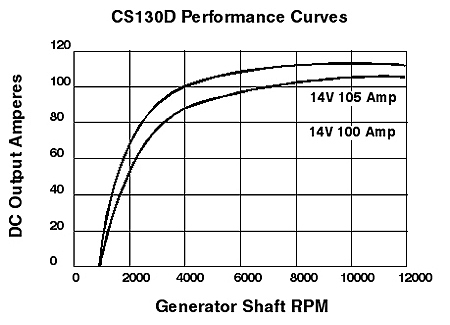 A CS-130D with an output of 105 amps uses a three-phase stator with a 6-diode bridge rectifier. Each forward biased diode in the array will have 35 amps running through it. AC is rectified on pos/neg voltage waveform fluctuations, three phases equate to three diodes in the positive and three diodes on the negative voltage swing. Each of the three diodes will have about 1Vdc drop across it, which equates to 35 watts per diode (35 amps with 1Vdc forward bias voltage drop) or 35Volt/amps (35 watts)…times three, or 105 watts of heat generated by only the diodes themselves. Dual fans are a must to cool these units. So stick with the OEM replacement parts and spend the extra $15-$20 dollars for OEM regulators and rectifiers just to be on the safe side, when you have these generators rebuilt. Most of the CS regulators use Application Specific Integrated Circuits (ASIC). And more to the point, Application Specific Voltage Regulator (ASVR) computer designed chips, which may be encased in a plastic housing or a heat dissipating enclosure of metallic structure. As a side note, Delco refers to their ASVR regulators as All Silicon Voltage Regulators. A word about aftermarket products and alternators purchased at some of the lower tier automotive aftermarket outlets. In the VAST majority of cases, the only things that go wrong on alternators are the brushes wearing out (resulting in a weak magnetic field, this can be easily checked by placing a screwdriver against the alternator case) or the internal regulator/rectifier or diodes going bad. Unlike the 10-SI or 12-SI units, repair of the CS-series alternators by the layman is not nearly as simple as it used to be. The diodes almost always short out or begin to “leak”, this is why many folks first notice battery drains, and in the morning the vehicle does not start. Avalanche diodes “collapse” and allow field current to continue to flow, thereby continuing the alternator’s output, instead of shutting down (losing forward bias) and starting up (overcoming forward bias thresholds) which creates surges and spikes. These diodes eventually leak and allow a path to ground, which eventually will drain the battery. When the regulator goes, generally overcharging or undercharging are the symptoms, and if you have the “L”-terminal connected to an interior lamp, the lamp should begin to glow, giving you a fault indication. So, if the lamps lights then look for an under voltage or over voltage symptom, or perhaps a wiring fault. So…brushes are cheap, $10 dollars will usually suffice, and diodes are not expensive either. Rectifier/regulators (good OEM versions) will cost in the neighborhood of $35-$40 dollars. Whew, it is a wonder they work at all, eh? I will point out that unsoldering the lead connections of the stator field coil wires can be “problematic” (PITA) if not done correctly. Otherwise that is all that generally needs to be replaced when overhauling these units, the regulator and the brushes. About $40 dollars, tops, and your time and skill to remove, disassemble, repair, re-assemble and reinstall the unit. As an aside here, Bosch seems to do a good job on rebuilding the CS-130 alternators, and these units are priced reasonably. Now, to get a bit practical, here is what you can do for your FSJ. For you guys and gals who want a CS-Series alternator for you Jeeps but don’t want the hassle of searching parts yards, AutoZone sells a CS-130 105-amp alternator that will fit our Jeeps. 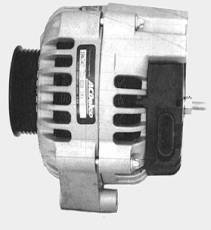 It is a Duralast Gold alternator made by Johnson Controls (they make ima, Interstate and Sears Die Hard batteries). These alternators are completely rebuilt using ALL NEW components, and they are lifetime warranties. So putting down $140 dollars buys an alternator made by a quality company and will last you a lifetime of service and AutoZone locations are everywhere. The CS-130 model number you want is a DLG1352-5-11 or a DLG1352-6-11. This translates to a Duralast Gold (DLG) 1352 (CS-130 105-amp alternator with mounting ears at 12:00 O-clock and 6:00 O-clock) with either a 5 or a 6 groove serpentine belt and an 11 O-clock clocking position. Once you buy this alternator and the associated plug that goes with it (about $7 dollars) that is the last alternator you will ever need to purchase. If it fails, you just go down to the local AutoZone and get it replaced for free, they do charge a core charge, so save that old 5 or 6 groove serpentine pulley to place back on the unit if for when it needs replacement. The CS-144 model that you want is an O'Reilly Auto Parts alternator for a 1986 Buick La Sabre front wheel drive with a 3.1 Liter V-6 engine (Engine Code B) has the correct CS-144 alternator for our Jeep applications. It is rated at 120 amps, and has a single “L-Terminal” and can be fed from an ignition switched 12Vdc source. Delco-Remy rebuilds these using all new parts and they utilize some great OEM components, with the additional benefit of a Lifetime warranty. For those of you who want to keep your wiring harness intact, there are also adapter harness plugs that Delco sells that convert your existing Jeeps SI alternator harness plug to plug into the CS-144 alternator. An additional backup feature of this type of set up is no modification of the existing wiring harness, and you are now able to use either SI or CS alternators at will. These SI-to-CS adapter plugs have a Molex connector to fit the existing wiring harness SI style connector, and the Delco Weather Pack connector to fit the CS-130 and CS-144. The following are the SI-CS conversion adapters without the internal resistors for the “L-Circuit”. 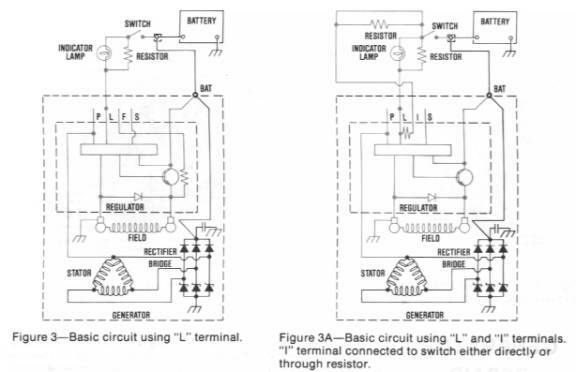 Delco makes a SI-CS conversion adapter that includes the resistor for the “L-Circuit”, and this resistor duplicates the electrical characteristics of a Lamp Circuit. I haven’t checked this part out yet, to measure the resistor that they include, but suspect that it is probably a 35-500 Ohm resistor from the No. 1 terminal of the SI-plug that is re-routed to the “L-Terminal” of the CS-Series plug. Some Jeeps even have the serpentine belts, so perhaps it will fit perfectly, however I am not at all sure of this, I have just heard rumors that some Jeeps have serpentine belts. Need to do a bit more research on this issue and edit this document with the result, so for now this is merely speculation, you can best determine your specific requirement, right? If you have a Jeep with a serpentine pulley please e-mail me with details so that I can include this into the document and update. Here are some more part numbers that may very will apply, however I pulled these from a Hummer website and include them only for reference, since I have not personally checked them out! I came across them on a Google search of the above DLG1352-5-11 alternator and I have not researched the companies that re-manufacture or provide the following alternators. The other alternators might very well be a good solution for you, but use caution, I do cannot recommend any but the DLG1352-5(6)-11 units as I have no experience at all with them. I provide these merely as a starting point for your own research. As I find time I will investigate the below items and report back via an edit of this document in the future…. For you DIY-types, to find an alternator that will fit your Jeep, you can take your alternator to a pick and pull junkyard, and look for a '85 to '90 Chevy or GMC product, like a truck or (in my case) a rear-ended Chevy Corsica, or Lumina. I got a brand new CS-130 105-amp output unit that had been recently installed. The Delco sticker was still bright white, and shiny, and the unit looked like it was placed in the vehicle the morning of the accident, our local pick-n-pull has at minimum 3000 vehicles and cost $1 dollar to enter and browse, so on slow days I go down and locate items of interest and note on a map drawn of the yard where the item is located and the model and year and engine of the donor vehicle. Then I try and research the item of interest to determine the value to me. Look for a 12 O-clock and 6-Oclock mounting with a 10:30-ish or 11:00 O-clock position for the model you choose. Refer to the 10-SI picture (rear side) to visualize what will work. The Buick LeSabre's of 1986 with 3.8 Liter V-6’s and engine code “B’s” will do nicely with a CS-144 for you. CS-130D’s can be found on Trucks, Caddy’s and the CS-144’s are available on heavy-duty applications. Some folks for ambulance versions, as the load that they are required to support is fairly “critical” and the alternators output at idle is very stable and higher than the “run of the mill” units generally available. So, getting back to our junkyard alternators, pull the alternator and on the way home, stop at any Auto Parts store and have them check it out on a test stand. After the unit is found to be good, buy an appropriate connector to plug into the back of the alternator, don’t forget this little detail, or back to the store you go! If it is bad, I hope the bone-yard will allow you to return it. Get their “lifetime warranty” guarantee, it will save a bunch of money in the long run, and waste quite a bit of your time in the mean while, but this is a DIY type project, otherwise why bother reading all this information? The pulley will have to be changed, as most of the Chevy/GMC products use a serpentine belt, most FSJ’s use a V-belt. Anyone with an impact wrench (tire change shop or garage that fixes flats) can do this for you, just stop by and offer a dollar for the greasest/natiest clothed guy there to remove it for you, I have never been turned down, especially if you time it just before lunch… timing is everything… eh? Take the front cover off, and using your old alternator as a pattern to refer to, "re-clock" the front housing so that the alternators rear plug in harness will be in the same orientation as your old alternator, and the mounting holes line up the same as the old alternator. Additionally. Ensure that the Plug Housing and the Generator output threaded post do not place the associated wiring in close proximity to your exhaust manifold. So, what is this clocking that I am referring to? Well, on these alternators there are mounting holes on the housing. 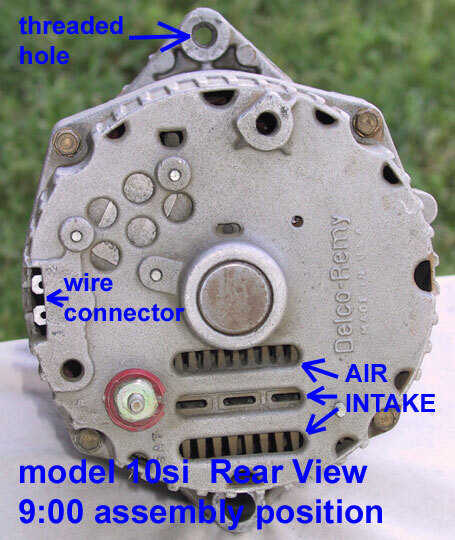 Holding that alternator up and viewing from the back of the alternator with the mounting hole at the “12 O-clock” position, note where the regulator connections are oriented on the “time piece face”. The connector plug should be at the 10:30/11:00 O-clock position. The following depicts a 12:00 O-clock orientation (see the regulator terminals at the top?). You will want a 10:30/11:00 O-clock orientation. By re-clock I mean that the two piece housing can be pulled apart, and the pulley side of the housing can be turned either clockwise or counterclockwise in order to ensure that the mounting hardware and the back plug are oriented the same way as the old alternator, which allows you to plug in the harnesses and connect the output of the alternator so that no shorts, or excessive heating occurs as might be the case if the wire harnesses were allowed to connect to the exhaust manifolds. Here is (I believe) a major culprit of Jeep fires and burned wires, simply an error in mounting the alternator, and not re-clocking properly on an aftermarket alternator purchase. Go figure…. Otherwise the plug in harness may go up against the exhaust manifold...not good, and the tensioning bolt hole will not be in the right spot, also not good. You are ready to install, total out of expense so far should be about $30 dollars. The BATT goes directly to the solenoid post that connects directly to the positive battery post. 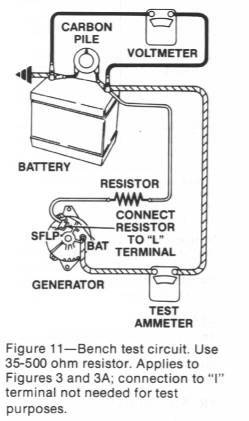 The "L"-Terminal can be used to supply the voltage "sense" to turn on the alternator. On the older FSJ’s there was a wire resistor feed to Terminal No. 1 on the 10/12-SI units, this could serve. A better choice would be to mount a light in the cab, and connect its high side to a switched 12Vdc source from the Ignition Switch and the low side to Terminal No. 1… wait a minute…there is already such a wire in the harness, the resistor wire. So replace it with a better insulated resistor wire, and that takes care of the L-Terminal pigtail on the new connector. The “S”-Terminal can be fed from the Battery if you wish, a better method to detect the status of the battery is at a load distribution point (the Splice between the Solenoid post and the ammeter), those with a Voltmeter can tie into their Red Splice. The “I/F”-Terminal is a bit tricky. If the vehicle that the unit came out of did not have an idiot lamp, then this terminal was probably fed from the Ignition Switch thru resistor wire. More importantly, other regulators used the “F” designated ion of this terminal, and if this is the case, this terminal will be an output to the ECM of the vehicle feeding a 12Vdc square wave to the module so that it can monitor the loading on the Alternator and adjust variables as it sees fit. So, if it is indeed an F-terminal regulator, do not connect it unless you know what you are doing. The CS130D and CS144 alternators are an improvement on the CS130's. Summit also has kits for Jeeps, and there are other vendors who will supply you with everything and install it all for about $150 dollars. Any alternator/rebuild shop can get it done so ask them to install an OEM DELCO ASVR! Now please understand that I skipped over just about a bazillion technical issues on this post, but it will give you a general idea of the charging systems on these old FSJ's, and yeah, I know my wiring instructions are pretty sketchy, so many details…so little time. Jeep FSJ’s were made from the 70’s to the 90’s and there are variations in the wiring. 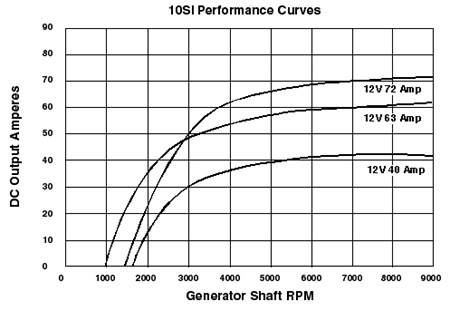 Additionally, there are other items to consider, such as the conversion plugs for SI-to-CS and which CS-Series alternators is the best for your particular application. One note of interest here, is that if a CS-144 is chosen, and then Mobi-Arc sells a Mobile Welding unit that has received good reviews that can use the CS-144 (you must change out the regulator for NON AVALANCH diodes) and for about $600 additional dollars you can weld up to ¼-inch stuff. So this might be worth considering. Just don’t go out there and burn up your vehicle because you read this, and do not fully understand what it is that you are doing. I am writing this so that those of you may better understand these systems, and may benefit from some of the info presented. If you do put in one of these more powerful alternators then the rest of the system must be up to par! For instance, that CS144 Iceberg upgrade for the $18 dollar “You-Pull-It” parts yard is now installed and you are beaming with pride. Now you have the amps to get that ghetto-blastin-rockin-shockin-stereo installed. Unfortunately, you neglected to upgrade the wiring in your ammeter circuit, and the ammeter output has just contacted the exhaust manifold and has now burned your FSJ to the ground…DOH! One other note, with all of the variations in CS-130, CS-144 and CS-130D alternators and their regulator circuits, it pays to know what regulator circuit has been included in that re-built alternator that you pulled from the junkyard. So, when you stop off at that Auto Parts Store, have the part guys/gals check it out for you. They will generally know, or the management there will generally know who re-manufactures the alternators that they sell. There has been a lot of chatter about this/that P.S. alternator, when in reality it is the users lack of understanding and simplistic “one alternator is a good as another” attitude that may be the real problem. Things can get complicated with these new regulator circuits (computer chips) and that is part of the reason that I have taken the time and effort to add to our knowledge base. Life is complicated enough, without having Jeeps that won’t start, or Jeeps that burn.